At Stoney End, we’re dedicated to our beautiful hand-made insturments, exceptional service, and a truely unique experience. We strive to make quality harps attainable for musicians everywhere. We make every Stoney End harp in our converted-barn workshop in Red Wing, Minnesota. Starting with the best quality materials, we carefully hand-craft each harp to be better-sounding and naturally beautiful. And through the years, we continue to refine our technique and materials, resulting in superior sound quality and better playability. Each harp in our product line was designed by Stoney End to meet the many needs of musicians, from beginner to advanced. And because we design and build every instrument, we can make a harp exactly to your specifications—you pick the wood species, style, and ornament. At Stoney End, we make simple lever harps based on the Celtic and Gothic traditions. Our instruments—and our people—are charming and down-to-earth. We focus on the natural beauty of the materials and the centuries-old tradition of folk instruments for the joy of music. Stoney End is one of the few harp makers in the Midwest and we pride ourselves on our strong presence in the surrounding community. While you can purchase a harp at a local retail music store, you won’t find the same focus, quality, and unique experience there. We strive to enrich the enjoyment of our instruments with events, concerts, lessons, and hard-to-find sheet music and accessories. For many of our customers, playing the harp is a life-long dream that has always been too difficult to realize. 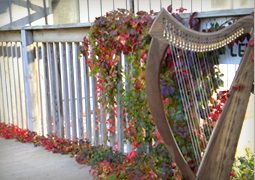 Stoney End makes owning a harp possible with our affordable, high-quality, and easy-to-play instruments. We even have a rent-to-own program and installed payment plan to help you on your way. We know you want your instrument to play beautifully for years to come. That’s why each Stoney End harp comes with a 5-year limited warranty. And we are always willing to make repairs or trade-ins on our own harps, no matter their age.